(Bloomberg) -- It’s official: Asian stocks are on an upswing. With the MSCI Asia Pacific Index putting in a second solid day of gains Wednesday, it’s now up 10 percent from its December low, fully reversing the conventional definition of a market correction. With most key markets in the green Wednesday, the benchmark gauge is within striking distance of its highest close since October. Investors in both Asia and the U.S. are bidding stocks up after President Donald Trump hinted there may be some flexibility around the March 1 deadline to raise American tariffs against Chinese products if the two sides are close to a deal. S&P 500 Index futures edged higher after the index closed above its 200-day moving average for the first time since December on Tuesday. The latest apparent olive branch builds on weeks of growing market optimism as the U.S. and China have cycled through a series of talks seen as constructive. Mid-level officials began discussions Monday in preparation for two days of talks starting Thursday involving U.S. Trade Representative Robert Lighthizer, Treasury Secretary Steven Mnuchin and Chinese Vice Premier Liu He. Despite the uplift in the past few weeks, a select look at technical indicators in Asia shows the outlook for stocks may be a bit more mixed. The regional benchmark remains below its 200-day moving average, and would need to climb more than 1.5 percent to reach it. At the same time, its 14-day relative strength index is once again nearing an overbought level. 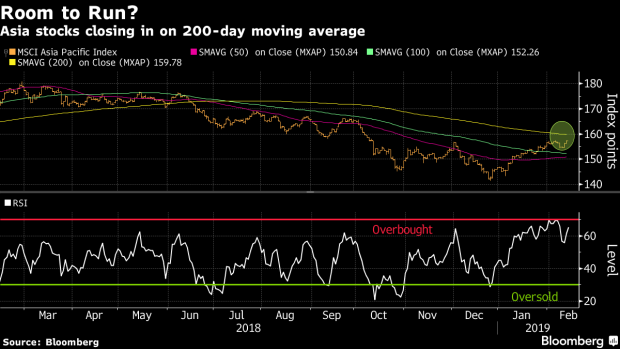 Hong Kong’s Hang Seng Index, which has also recently cruised past its 200 DMA, is starting to show some signs of being stretched after a stellar start to the year. With the gauge at its highest since August, 90 percent of its members are trading above their 50 DMA, the most since September 2017. It’s also entered overbought territory, indicating gains might have come too quickly to hold. --With assistance from Natalie Lung.